Zoe: We use a traditional combination of European herbs that are known galactagogues, which means that they naturally promote milk production. The active herbs in this tea are fennel, anise, coriander, fenugreek and blessed thistle. Why are you passionate about helping support women with their lactation goals? The practice of promoting and supporting lactation through tea specifically goes back centuries, so it was honestly a great fit for us and a natural continuation of this wisdom and type of healing. Mother’s Milk was conceived in 1978. As someone who’s not always in the mood for strong anise flavors, we were so excited to see a second Mother’s Milk blend. Yes, we know that black licorice tends to be a flavor that people love or steer away from. Luckily our herbalists are really plugged into the natural healing space. They tapped into the wisdom of Ayurveda for the combination of shatavari and cardamom which has a delicious sweet and spicy taste, kind of like chai. This combination of herbs has been used by Ayurvedic practitioners for generations to help with breast milk creation and healthy lactation. You’ve decided to make the move beyond tea to create other products for moms. Tell us more about why. Honestly, it was the combination of a few factors. First, we’re the #1 selling nursing tea in the US but we also know that it’s not always convenient or even possible for a mom to brew a cup of tea for herself. Secondly, as a nursing mom myself, I know that feeling of insatiable hunger that comes with being a lactating mother. Third, moms are already eating bars and snacks on the go. That is why we decided to create Mother’s Milk bars: they have all the goodness and lactation promoting galactagogues of our Mother’s Milk tea but are in a more convenient, on-the-go form. Our chews are an even greater extension of that convenience. They can be tucked into your purse or diaper bag and munched on whenever that deep hunger strikes. It’s a true win-win: you’re satiated and are helping support your milk production. We noticed on your site that there are a number of other products specifically tailored to women. Would any of those be helpful for our mamas? This is something we are really proud of: we support the entire journey of motherhood. We have our Healthy Cycle tea that supports a healthy menstrual cycle before pregnancy. We support pregnant women with anti-nausea lozenges to ease morning sickness in the first trimester and Mommy To Be raspberry leaf chews to tone the uterus and prepare the womb for childbirth. Then we have our entire Mother’s Milk line for the postnatal lactating mama. Finally, we have a variety of relaxation and nighttime teas because we know that just because your baby is finally sleeping doesn’t mean that you are! Ok, we’re officially in love; where can we find these products? Our newer products like the chews, bars, and lozenges are all available to purchase online. 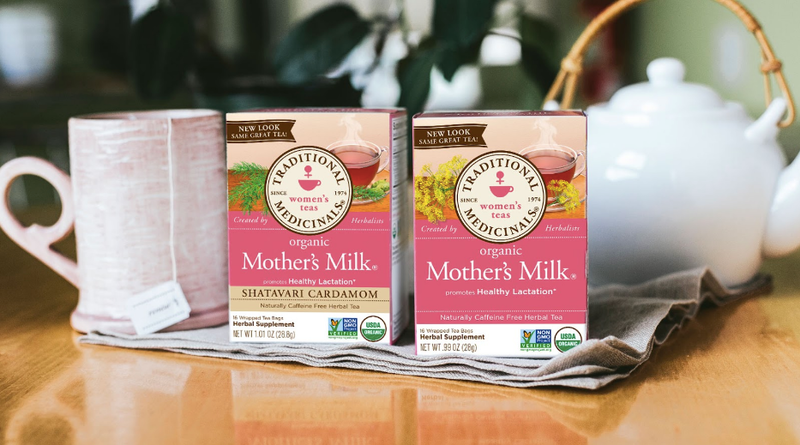 You can additionally find our classic teas like Mother’s Milk original is stocked in most natural grocery stores. Ready to try it out for yourself? Use the click on the coupon below and use code "NEWMOM18" at checkout for 15% off your first purchase! Since 1974, Traditional Medicinals has been a pioneer in the wellness tea category. Not only are their products made of the highest quality ingredients, but they are a Certified B Corporation dedicated to sustainability, and social and environmental activism. In short: they are good, thoughtful people making exceptional products. Learn more here.